Bees? Are they dancing or are they talking? Are they talking or are they dancing? But wait! They’re doing both! . . . at the same time! It’s called the waggle dance. It’s, at least, one of the ways bees talk to each other. What is the dance like? Well, it involves waggling. And, before the dance was understood to be a kind of language, at least one person who saw it, Nicholas Unhoch, thought the bees’ danced just for a good time — enjoying “jollity.” Then, Karl von Frisch got the idea that the bees were talking with the waggle dance. He was a patient man. He spent years observing and cataloging the “language” of the dance. The dance is called a “recruitment” dance because the dancing bee is trying to get other bees in the hive to travel to a particular location at which, the waggle-dancer promises, the bees will be rewarded with loads of honey. The dance language goes like this. Imagine one of those old dance-step charts, showing footprints, which would be put on the floor to train would-be dancers. The bee-version would be tacked up on the wall of the hive — actually, attached to the front of the honeycomb. With bees, dancing is more of an “up and down” affair – unlike the human “back and forth” dance movement. On the chart, you’ll see one straight line up the center; then, two lines curve out to the right and left at the top and, then, bending down and back inward to reconnect to the bottom of the straight center line. The bee dancer may follow this circuit more than 100 times. The dancing bee follows that straight center line upward from the bottom to the top waggling all the way. This is called the waggle phase. Then, when the waggle-dancer reaches the top of the straight center line, it stops waggling and goes to the right and back down to the bottom of the center line. Then, it waggles its way back up to the top and, turning left this time, stops waggling as it goes back down to the bottom and repeats its climb to the top waggling all the way. But what does the dance say? Well, first, it’s about direction. If the bee waggle-dances absolutely straight up from bottom to top, before turning left or right, it means that, when the recruited bees leave the hive, they will find the honey by going in the exact direction of the sun in the sky. If the “waggler” dances upward at even the slightest angle to the right side or the left, that is the exact angle to the right or left of the sun in the sky that the other bees must fly to find the honey. Not only are waggle-dancing bees really good with angles, but these bees know how the sun moves. Even if the bees linger in the hive for a long time after seeing the dance, it won’t throw the waggle dance directions off a bit. The bees will compensate for the sun’s change of position by making the precise corrective adjustment necessary to locate and, then, follow the correct direction. But knowing the direction of the honey is only half of what the recruited bees need to know. To find the honey, they also need to know how far they’ll have to travel in that direction.. The distance is just as precisely communicated by the waggle-dancer but, now, with the timing of the waggling performance. The longer the waggle-dancer takes to dance up the straight path from bottom to top, the farther away the honey will be found. Yes, just because a bee waggles doesn’t mean that the other bees must follow. The first and greatest challenge is competition. When I first heard this description of what happens in the hive, it reminded me of a row of pitchmen at a circus or fair. There may be several, or something like a row of, bees each doing its own waggle dance, at the same time. Each hoping to recruit it’s fellows to the hoard of honey that particular dancer has discovered. As long as were discussing sales, you might wonder if there’s an art to sales even among bees. Do some pitches work better than others? Do some wagglers not just offer the steak, but “sell the sizzle? (Better: Do some bees not just offer the honey, but sell the sweetness?) But, even with bees, enthusiasm sells. The more excited the bee is about the honey source, the more rapidly it will waggle, communicating its excitement about its find to the recruit-able bees in the audience. Somehow, I can’t help imagining that I’ve seen this excited waggle in other . . . creatures. When my dog hears the jangle of its leash, he runs back and forth between where I’m standing and the door, excited to be going outside. I think I’ve seen him definitely waggling. There are “Do Bees” and “Don’t Bees.” Bad behavior isn’t restricted to humans. Overly enthusiastic waggling bees occasionally get out hand when it comes to sales. When competing with their fellow wagglers, the dancers will, sometimes, disrupt their competitor’s dance. Their competitor, in turn, will fight off the disruptor. I can imagine the whole hive dissolving into the bee version of a barroom brawl. But what about the potential recruits? Do they watch dutifully to determine the best source and carefully note the direction and distance to the honey. Surprising, like children in school, a few do, but most don’t. Whether day-dreaming or quietly buzzing with their friends about hive gossip, many miss the waggle message completely. Then, what happens when these inattentive bees are jostled from their distraction by the need to search for honey? Well, they may lag, just a little, until the swarm forms. When it takes off to find the next meal, these less informed bees will just follow along behind the swarm to find the honey. 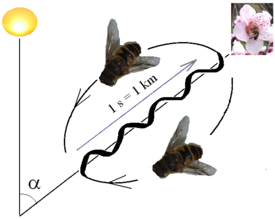 What happens if a bee lags even longer and misses the direction of the departing swarm? Not to worry. Some bees just fly out of the hive and look around on their own hoping to catch a lucky break and find some honey by chance. In spite of the “Don’t Bee” slackers, the waggle dance is important to the survival of hives when honey is hard to find. When supplies are short, the scouts who come back to the hive to waggle-dance are the chief sources of information about honey location and, often, the only available sources of honey for the hive. Only in good times can some bees slack off and others go their own way when gathering honey. After the swarm follows the waggler and gathers a lot of honey, the bees will return to the hive loaded down. Then, the returning bees pass their honey to receiver bees. The receivers, in turn, seal the honey in the comb for storage. But what happens if a swarm comes back loaded with honey to find all the rest of the bees are leaving to gather yet more honey, themselves? Well, the load-carrying bees have to stop the departing bees from leaving because they are needed as “receivers.” How do the loaded bees get the message across? Another dance. The “tremble dance” is used to recruit receiver bees for unloading and storing the honey brought back to the hive by bees carrying a full load. And there are more dances. If a bee gets infested with mites, or just covered with dust, it can do the “grooming dance.” That dance recruits other bees to help the mite-infested or dusty bee get rid of its mites or clean itself up. We move faster and faster into the future. Every day, we meet an endless stream of terms and phrases that have suddenly appeared to describe the new, the amazing and, sometimes, the almost indescribable. Biorobotics is a word with a problem. No one has decided exactly what it is or what it isn’t. For sure, it’s used to describe three things. First, biorobotics is the study and practice of making robots that imitate biological organisms. Robots like Boston Dynamics’ Big Dog, UMD Robotics’ Robo-Raven, or ROBOTNOR’s Wheeko the robotic snake are all examples of biorobotics. But some biorobotic devices imitate things as small as, or smaller than, living cells. Imagine being able to build small robotic devices, or “nano” robots, that could be injected into a person’s bloodstream. These tiny robots would be designed to work like super antibiotics. Once inside the body, these nano robots could cure infections almost instantly. Other nano robots of the same kind could clear clogged blood veins or even repair damaged blood vessels. These tiny ‘bots could allow a person to live years longer. Second, biorobotics includes what is sometimes called “bionics.” The word bionics is now used to describe the study of how to integrate mechanical robotics into human beings — like TV’s Six Million Dollar Man. When mechanical devices are actually used to replace or improve the function of human organs, the result is a “cyborg.” Technically, something as simple as a heart patient’s pacemaker makes the user and device, together, into a cyborg. Third, biorobotics also is used to describe to the study of genetic engineering. This has little to do with machines, mechanics or devices. Instead, genetic engineering is the actual design and development of new and unique living organisms. This requires an understanding of genetic material, DNA. This, also, requires a very precise technology for arranging DNA “parts” it into new patterns or designs to produce new life forms or old life forms with new and different characteristics. No one is able to genetically engineer even small life forms at this time. But researchers are working toward that goal. As a gardener, I would look forward to a really, really blue rose. (The roses on the market now that are called “blue” are actually sort of purple). Mark Grossman: What is a Cyborg?